Flatpack is back! 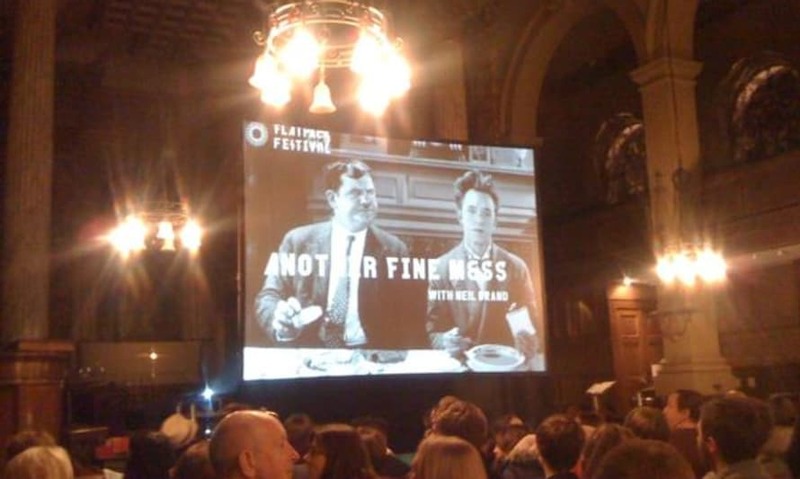 The festival returned to Birmingham with a bang last night for our eagerly awaited sixth festival with silent cinema extravaganza Another Fine Mess. Crowds gathered after hours at Birmingham Cathedral to enjoy a feast of comedy classics from the early days of film, all of which were selected, presented, and scored live by acclaimed composer and pianist Mr Neil Brand. The show began with Hal Yates’ slapstick comedy A Pair of Tights (1929), which showcases the underrated talents of Anita Garvin and Marion Byron, and features a cameo appearance from the patron saint of this year’s festival, Erdington born Charlie Hall. Next up was Cecil Hepworth’s gripping short The Dog Outwits the Kidnapper (1909), starring a courageous canine that saves a toddler in such an ingenious way that it provoked loud laughter from the audience. There were also a few unexpected treats in store, including the amusingly bizarre The Fatal Sneeze (1907), a trippy French version of Ali Baba and the Forty Thieves, known as Ali Baba et les quarante voleurs (1902), and an extract from Georges Melies’ beautifully hand painted and wildly imaginative Voyage à travers l'impossible (The Impossible Voyage) (1904) that held the audience enthralled. The night ended with a lively screening of Laurel and Hardy’s You’re Darn Tootin’ (1928), where Brand gave the audience the opportunity to provide audio effects by tearing paper to simulate the sound of trousers ripping during the famous climax. The audience reaction was overwhelmingly positive, and Brand was a splendid host whose knowledge of and affection for these films showed in abundance. Birmingham Cathedral also proved to be the ideal setting, both for its acoustics and for its striking architecture. The fun then continued late into the night with our opening night knees-up at the Jekyll and Hyde, where we sipped cocktails and enjoyed live music from Sugarfoot until the small hours. 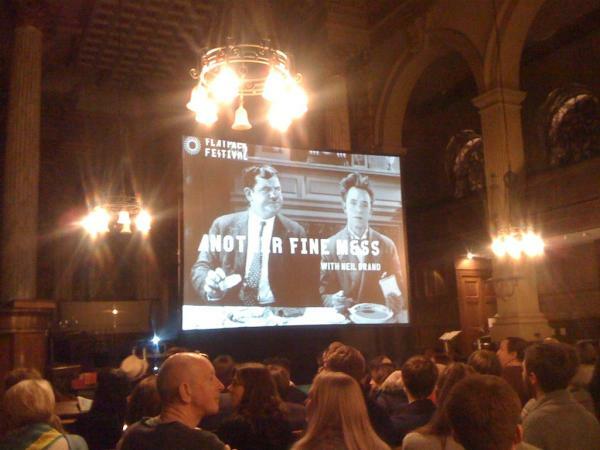 The evening also marked the start of Film Bug, our festival within a festival. Dreamt up in collaboration with Colmore Business District, Film Bug has taken over the district for the next two days to present a whole host of free screenings and events at a variety of local venues. Mercury Prize nominated jazz pianist Kit Downes will also be playing at the Birmingham and Midland Institute in a multimedia performance with animator Lesley Barnes. More info here. Other venues include The Old Joint Stock, Café Costes, Urban Coffee, The Old Royal, Jekyll and Hyde, and BIAD. Thanks to all who came along last night and to everyone who made the event such a success!